Interiors can be designed so that they can transmit a variety of sensations and impose different attitudes: to the sumptuous and elegant until the familiar and welcoming. Pastel colors are placed in the series of elements which accentuate the idea of comfort and transmit a feeling of relaxation, calm and balance. The delicate shades of pastels can discretely dress up the interiors, the maine reason being the lack of noisy strong colors. In addition, being on the palette of light tones, they accentuate the brightness of the room they are placed in, giving it a plus of vitality not just through color but also through brightness. There is out there the prejudice that pastels are irrevocably a feminine style. It is true that if we talk about delicacy, discretion, and warmth, we have the tendency to go towards the idea that they are associated with femininity. With that being said, we must not lose sight of the fact that pastels do not mean exclusively pink shades. Not to speak of the fact that pink, itself, is no longer a color forbidden to males. If there is still out there the sensation that the pastel dominance of a room undermines the masculinity of an interior, a very easy solution can be introduced by adding colors in darker shades of grey, wood or stone. 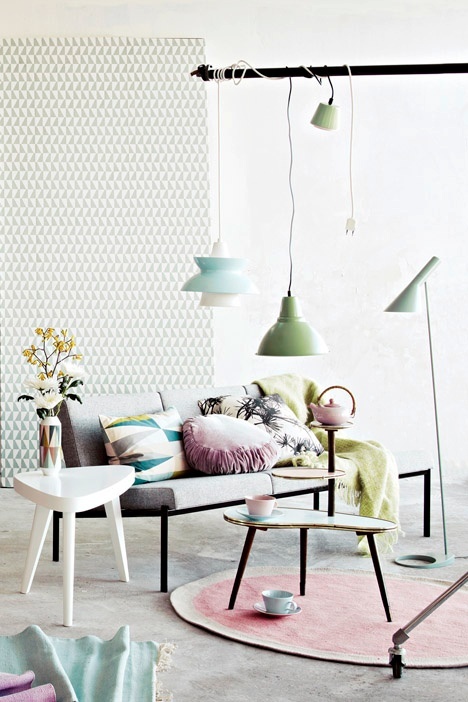 We can also add depth to the room by using pastel colors combined with more intense shades or daring patterns. Pastels can then be used as accents so that they can diversify the palette of the dominant shades, or they can be the dominant ones themselves. Another appreciated quality of pastel colors is the fact that they can easily be combined with natural tones. Pastels very good complement the tones of wood, as it happens, for example, in the case of mahogany wood that can easily be filled with pastel shades of yellow or green pistachios. Although they can be applied as the dominant shades as it happens when you are chosen to paint the walls of a room, upholstery or large items of furniture, pastel colors may as well be introduced, as mentioned above, as simple accents. In the latter situation, they can be found in the lighting, chairs and even appliances or maybe in decorative painting. The possibilities are endless and the potential pastel colors is one that deserves undoubtedly be exploited.